Buckeye Tractor manufactures specialty field equipment for the production of vegetables, fruit and flowers. Some applications for nurseries and landsacaping. No grower too big or too small. Agricultural equipment for fresh-market and wholesale production of vegetables, fruits and flowers. Also applications for landscaping and nurseries. Small or micro machinery for home gardens, homesteads and hobby farms. 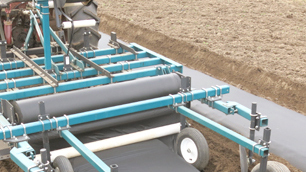 Products include Disk Bedders, Bed Reconditioners, Bed Shapers, Bedder-Layer Combos (Raised Bed Mulch Layers), Mulch Layers, Row Cover Layers, Drip Tape Applicators (SDI), Dry Wheel Punchers, Water Wheel Planters, Toolbar Cultivators (Seedbed Cultivators, Row Crop Cultivators), Raised Bed Cultivators, Mulch Lifters & Winders, Drip Tape Lifters & Winders, Rippers, Bed Lifters (Undercutters), Sub-Soilers, Chisel Plows.